We have a frequent request to provide Electricians/Contractors with a quick & easy solution to a common problem – the need for a single button and a single light to operate when the button is activated. 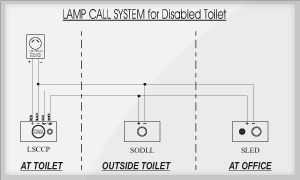 Alert Call have a cost effective standalone lamp call to suit this requirement. This system is ideal for fast food outlets, School sick bays and many more situations or locations. Alert Call wireless solution can also be utilised if separate buildings are involved such as schools. A Radio Call System with an Overdoor Light and Buzzer outside the toilet, and an Overdoor Light and Buzzer in the remote office with no wiring between buildings. This solution is very cost effective and easy to install. No special cabling or training is needed and can come supplied as simple DIY setup.